We provide interpreting service within Russia. If you plan a visit to Russia, please email us, and we'll give you the exact fee for interpreting. One of our specialists will accompany you and help in your relations with your Russian partners. First of all, we are ready to provide you with interpreting service in St-Petersburg. If you need an interpreter in another place, you have to pay some extra money ( usually it's not so much - tickets in Russia are rather cheap). 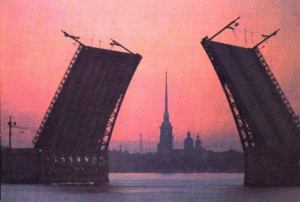 St.-Petersburg is one of the most famous cities in the world. Its inhabitants consider it as a true capital of Russia. We are always happy to show the city. The materials are accepted and delivered as e-mail in ASCII, MS Word, MS PowerPoint, MS Access, WordPerfect, Corel Draw, pdf, or in other format of your choice.